Here’s another book review. And let me tell you, Being a Project Manager is a unique book, in a good way. It’s been a while since I wrote a review or even read a Project (Management) related book. Just in case you are new to TPC, it’s a hobby of mine to review books on Project (management). The last book that I reviewed was the GAO schedule assessment guide. This time I’m going to review a book not related to the tool, but what it is to be a Project Manager. Being a Project Manager is a book written by Daniel Zitter and Hamutal Weisz. I know Daniel from his time at Mattan Solutions, a organization that I know for it’s Master Project functionality: MasterLink. Daniel has since moved on and is now a Co-Director of the Israeli company PMZone. And in that role travels the world to provide Project Management training for all kinds of companies. I have not had the pleasure of meeting Hamutal yet, but her bio tells me “[she] is an experienced project manager who has managed multi-million dollar IT and product development projects for different organizations around the world”. 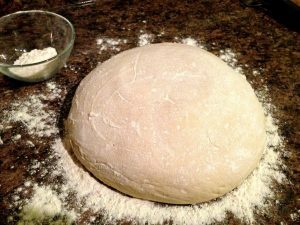 Now what is a piece of dough doing in a MS Project / Project management Blog you ask? Well… Being a Project Manager is by far the tastiest book on the subject of Project Management. Mainly because most images feature bread, or bread baking. Including French baguettes to represent tasks with linking dependencies is simply brilliant :-). Make sure you have a sandwich close at hand when reading this book, because you will get hungry half way through. The book contains valuable content for every project manager with up to 5 years of experience. The subjects such as creating a WBS, building a Project compass and Risk management are all covered. Although at parts it might lack depth due to the fact that the book isn’t that thick (240 pages excluding intro and summary). On their information page a complete tables of content can be found as well as additional information on the book (here’s the link again). What is strikingly good with this book is that it includes a whole list of useful Project Management files, 31 in total! Ranging from a Milestone Trend Report a Project kick off presentation template and a “Gantt in Excel”. Although I would advice using Microsoft Project for that last one of course haha. There is a e-course created by Daniel and Hamutal that covers all the content of the book. The course can be found at Udemy, a global marketplace for learning and teaching online where students are mastering new skills and achieving their goals by learning from an extensive library of over 55,000 courses taught by expert instructors. And I got you a 20% discount! All you need to do is sign up to my newsletter and I’ll mail instructions on how to use Udemy as well as the voucher code. Here’s the link to sign up.